The verdict: Welcome to Trader Joe’s answer to a Toblerone Bar. Instead of cute pyramids, you have rectangular teeth that are far too tall to be consumed comfortably. Seriously. This one could make your gums bleed. You bite it. It will bite you back. This is one of those products that you wonder who tested it (and approved it). Were they given the whole bar? Or perhaps a neat single square was already chopped off to make sure no one notices this flaw? We will never know. In either case you have a pretty unremarkable bar. It is both milk and dark chocolate in a pretty pattern. 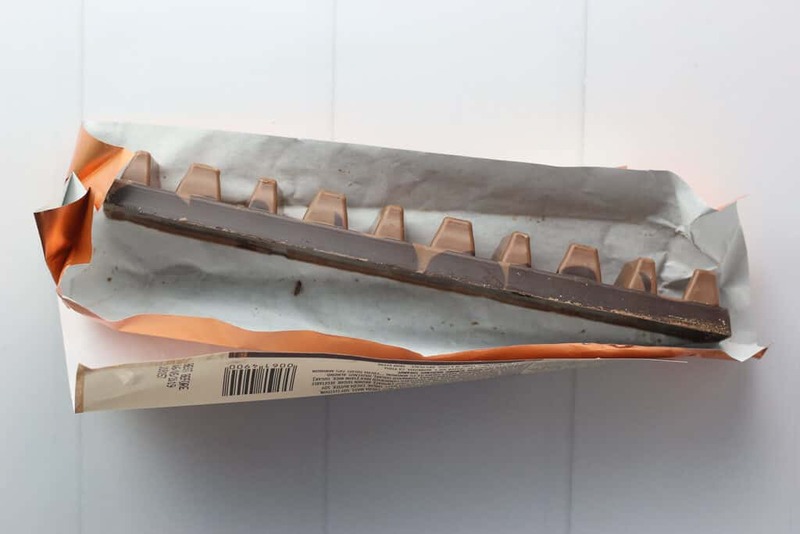 But beyond the pretty pattern and terrible shape design is what tastes like mostly milk chocolate. 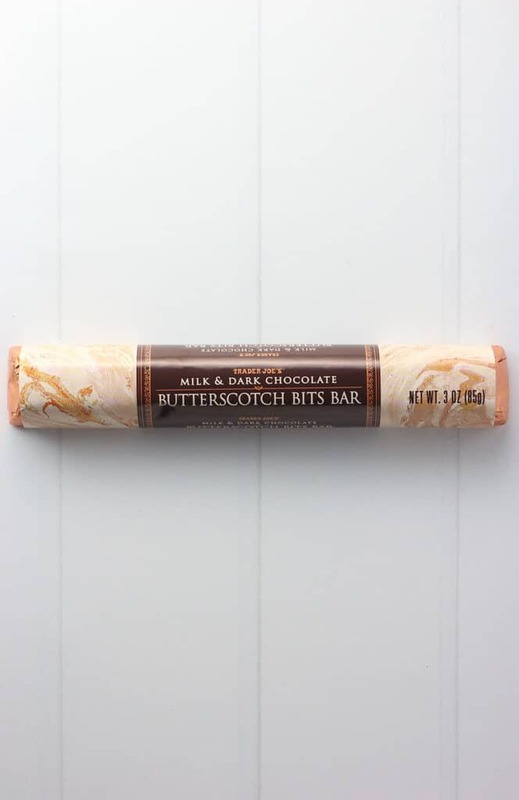 So the last point of what makes this bar different is the butterscotch bits. Bits is also an understatement. Like they are few and far between. 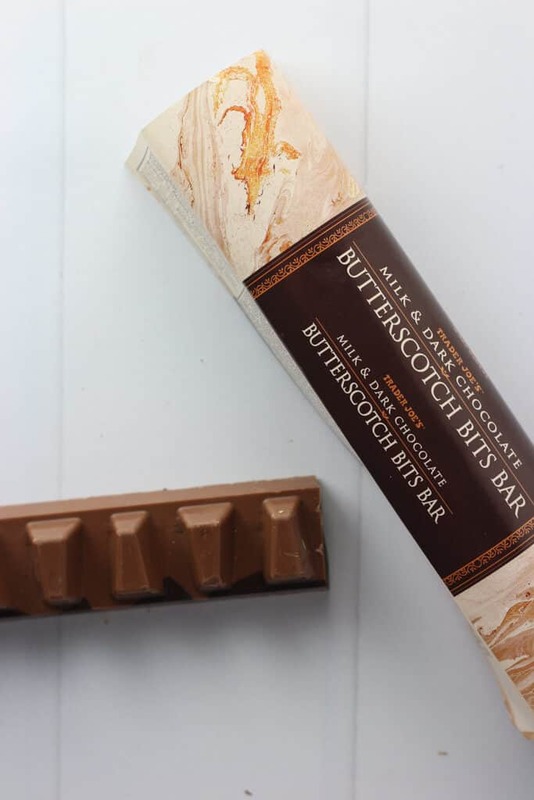 I think I was hoping for way more and only got a tiny mouthfeel for the few butterscotch crunchies in this bar. So it’s got a bad design, truly contains just bits of butterscotch, and is an otherwise unremarkable chocolate bar. For $1.79 this is worth skipping. There are plenty of great options on the shelf if you need your chocolate fix, but this shouldn’t be considered one of them. Bite into it the wrong way and it WILL bite you back. Would I buy this again? No, I will not buy Trader Joe’s Milk and Dark Chocolate Butterscotch Bits Bar again. You are not the only one that gave a negative review. Other bloggers had the similar issue as yours. It is back to drawing board for TJ’s. It did sound interesting! Maybe if they did a soft butterscotch center on each “triangle” then it might be better. I think this will not stick in the shelves for a long time. A soft filling would eliminate the fact that it bites back. Otherwise you are just biting into a solid bar. Like I said, the chocolate is fine, but they either need to rethink the shape or add filling so the chocolate cracks and it doesn’t slam the roof of your mouth. Thanks so much as always for stopping by Alek! I had heard horrible things about this far from people that try to and also from staff. Pretty much everything you touched upon. It’s a no buy for me for sure. I’m not big on chocolate bars to start off with but I absolutely love butterscotch. But from what I’ve heard the butterscotch bits are non-existent. I will stick with the sea salt butterscotch dark chocolate caramel balls. Those are my absolute favorite. Dag you are much better off sticking with those. I was looking forward to this one. I don’t usually write too many negative reviews but this one had me shaking my head. Thanks so much for stopping by as always! It is so bad that the staff also stated that?! WOW! That going be pulled off the shelves shortly. I’m not going see this sticking around for that long. 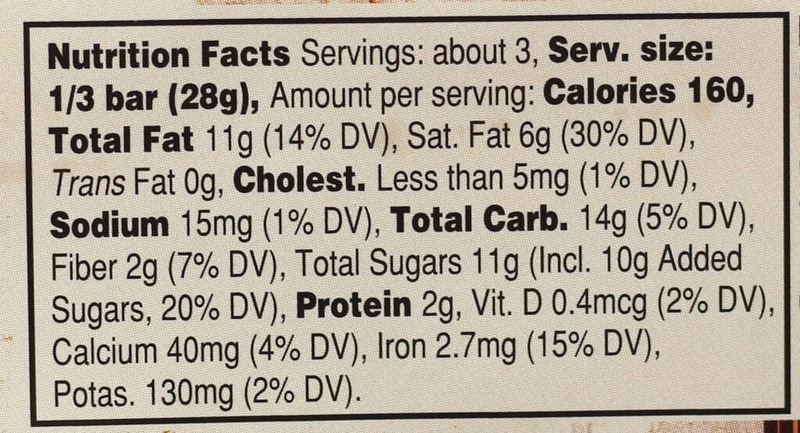 I guess it has to be reformulated again. Hey Alek! I think if they changed the mold dimensions it would be a total game changer. While they’re at it they can add more butterscotch bits (or a soft filling, I’d be cool with that too). Yikes! That sounds like a hard pass to me…. Will you return it? I always feel obligated to return anything that is a massive failure so hopefully they notice more people than usual returning an item. And extra disappointing to think you came home with some delicious chocolate! Hey Ttrockwood! I have actually not returned anything to TJs. This product was terribly shaped and sometimes I still pick at things while I’m writing up these reviews. There is something in my mind that says, “you wrote about it and ate half of it” so just let it go. If something is spoiled or inedible, I’ll bring it back. But I ended up chopping it up to put into some no bake energy bites in place of chocolate chips. The chocolate was fine, but as far as the butterscotch goes it didn’t deliver. Thanks so much for stopping by!